Arcade Joystick & Buttons USB Interface Kit for connecting an Arcade Joystick and Arcade Buttons to your computer or Raspberry Pi via USB. Perfect for Retro arcade projects with Raspberry Pi. This USB Interface Kit works with arcade joysticks and arcade buttons with 4.8mm terminals. HAPP Style Joysticks & Push Buttons work well with this kit. You just need simply connect your arcade controls into the interface board with the included wires, And then plug the encoder into your computer / Raspberry Pi's USB Port to enjoy your arcade games on classic controls. Supports all Windows systems including Windows XP, Windows 7, Windows 8, Windows 10, etc., Linux and Raspberry Pi 0/1/2/3 with RetroPi! 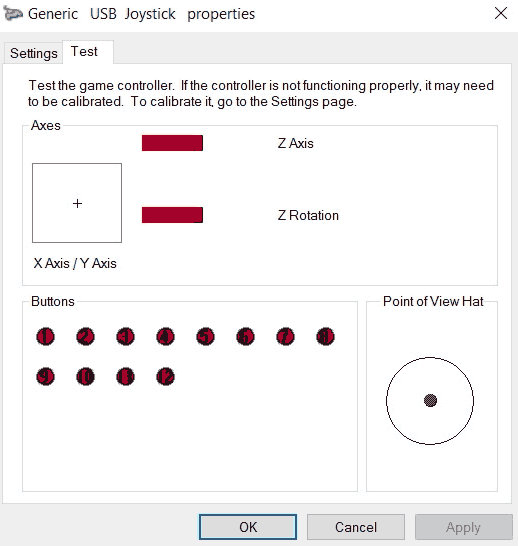 Make sure the AU, AD, AR and AL are connected to your Joystick's up, down, right and left respectively. Right-Click the Generic USB Joystick in Devices and Printers and click on properties. Now move the joystick around and look for the changes on the screen here. You can configure the inputs from this window as well.